Tagging the Vishniac photographs will be essential for creating search capabilities that will enable website users to find the photographs in the collection that fit their interests. The images can be searched through the metadata that will be created by the data technician at an earlier phase in the project’s development. The metadata has been structured according to the basic Dublin Core elements, and extra fields have been added in the metadata that reveal more information specific to Vishniac’s work. The following fields will be included in the metadata, and the text entered for each field will be searchable. Below I have included an explanation concerning the information that will be entered in each field in order to ensure consistency. (Note: Not every photograph has information for each of these fields. See examples at the bottom of this page). 1. Artist: Most of the photographs are taken by Roman Vishniac. 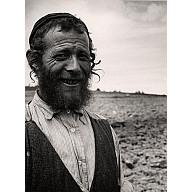 There is a small collection of portraits of Vishniac taken by other artists. 2. Title: Vishniac often writes titles on his photographs either on the bottom border of the print or on the mount or mat (just under the print) that the photograph is displayed in. If there is no title located in these locations, this field will be left blank. 3. Date: The genre of the photographs often indicates the approximate dates the photograph was taken in. Vishniac often writes different dates on separate prints conveying the same image so it is better to use the estimated dates in order to be accurate (ie. ca 1935-38). The data technician will be given instructions so he/she knows what to enter in this field based on the genre of the photograph. 5. Subject/Genre: The subject/genre is key in terms of classifying the content of the image and what phase in Vishniac’s career he produced the photograph. This field is especially important because the website user will have the option to browse the collection according to subject/genre. There will be a set of options for this category that the data technician can select from. 6. Themes in Unpublished Work: Since most of the unpublished images in the collection do not have titles, I wanted to create another option for searching Vishniac’s unpublished work. The themes will include children, adults and children, men (old), men (young), men (at work), women, urban (street scenes), rural scenes, ORT, religious settings, architecture, domestic interiors, animals, and insects. These motifs will be part of a drop-down menu that will be available to the researcher when browsing the unpublished work. 7. Type/Medium: All of Vishniac’s work collected at ICP are photographs and most of them are gelatin silver prints. 8. Coverage/Geographical Designation: The data technician will only fill in information in this category if Vishniac specifies a geographical location of the print in the title or in his notes on the back of the photograph. 9. Publication: This field will include any publications that the image was featured in. This field is especially important because the website user will have the option to browse the collection according to publication. There will be a set of options for this category that the data technician can select from. 10. Captions in Publication: The field will record the caption(s) included with the image in the publications that it was featured in. 11. Collection Source: Since the archive will combine the collections owned by ICP, the Howard Greenberg Gallery, and his daughter Mara Vishniac Kohn, this field will record the original collection that the photograph came from. 12. Current Location of Print: Since ICP is redistributing photographs after collecting them from Mara Vishniac and HG Gallery, this field will document where researchers can currently locate the print should they want to see it in person. 13. Identifier/Accession Number: Each photograph has an accession number that is its main identifier. 14. Published Number or Unpublished Number: Each photograph has been assigned a published/unpublished number since Vishniac often creates many prints of one image. This will help the archivists and researchers find out how many copies of each image Vishniac produced. Published numbers will begin with a V and unpublished numbers will begin with a U. 15. Contributor: International Center of Photography is the contributor and will be responsible for the digitization of the collection. I want to make sure this information is available to researchers. 16. Dimensions: This field records the size of Vishniac photographs. It first records the dimensions of the image (ignoring the border), then the print’s dimensions (which includes the border), and then the size of the mount should the photograph be mounted on a board. 17. Mounted on Board: Noting if the photograph has been mounted on a board is extremely important because it often conveys that these exact prints have been used in previous exhibits. There are three types of boards: 1) boards provided by YIVO (they put on a Vishniac exhibit in the '40s) 2) archival boards (non YIVO boards) 3) Masonite. 18. Format: This field will note how the original photographs were scanned. Most of the time it will say: Original images were scanned as 600 dpi TIFF files. 300 dpi JPEG files were then added to the ICP database and website. 19. Signature: This field will note if Vishniac’s signature is on the specific print and the location of the signature on the print. The signature increases the value of the print. 20. Vishniac’s Notes, print verso: Vishniac often writes detailed notes on the back of his photographs about the subject matter or when the photograph was printed. I think the information in this field will be especially important for researchers. 21. Stamp, print verso: The stamps on the back of Vishniac’s photographs often convey where the photograph was printed. 22. Other Markings: This is in case Vishniac made any other markings that do not fit the above categories. 23. Negative (y/n): This field will record if ICP holds the negative for the specific print. The negative often reveals decisions Vishniac made in terms of cropping. 24. Negative Format: This field specifies the format of the negative (if it is 35mm, 120mm, or glass). 25. Inclusion in ICP 2011 Exhibit: After 2011, this field will record if the specific print was featured in ICP’s Vishniac Retrospective. 26. Condition Report: This will record the general physical condition of the print. This will be significant to users who intend to request reproductions of the photographs. 27. Rights: This field will always say: Mara Vishniac Kohn owns the copyright to the Vishniac collection. ICP manages the Vishniac estate and will accept applications for reproducing Vishniac's photographs. 28. Notes: This field allows the data technician to record any other pertinent information that does not fit any of the above fields. All textual information in each of the above fields will be searchable for website users. The search screen will be organized in the following way and will also include drop down menus in the advanced search options. I have attached an excel document that outlines the metadata. It also includes the different options for “subject/genre,” “Themes in Unpublished Work,” “publication,” “collection source,” “mounted on board,” “stamp,” and “negative format” that I did not list above. These options will be used by the data technician as he/she writes the metadata. The text below has the metadata that accompanies 3 separate prints of the Vishniac photograph above. These provide examples for how the metadata would appear below the prints when accessed by website users. Dimensions: image: 9 10/16" x 7 10/16" print: 9 15/16" x 8 2/16"
Format: Original images were scanned as 600 dpi TIFF files. 300 dpi JPEG files were then added to the ICP database and website. Condition Report: general condition: fair/poor. Rights: Mara Vishniac Kohn owns the copyright to the Vishniac collection. ICP manages the Vishniac estate and will accept applications for reproducing Vishniac's photographs. Dimensions: image: 13 5/16" x 9" print: 13 5/16" x 9" mount: 19 15/16" x 15 15/16"
Condition Report: general condition: perfect. Dimensions: image: 13 9/16" x 8 15/16" print: 14" x 11"
Condition Report: general condition: very good.